When it comes to celebrating one of life’s special moments, nothing does it better than a gorgeous delicious Orange Poppy Seed Gateau cake 10". Sweet with a hint of citrus, the delicately baked orange poppyseed cake stacked with layers of cream cheese forms a modest yet elegant feast for the eyes. Butter cake base weighing approx. 1.6kg, with poppy seeds, freshly squeezed orange juice and orange rind. Presented in a beautiful complimenting box with a posy of Sweet Roses. As only the freshest cake will be delivered from Pods & Petals, cake will be changed based on availability if notice of at least 1 day is not given for delivery within Klang Valley. 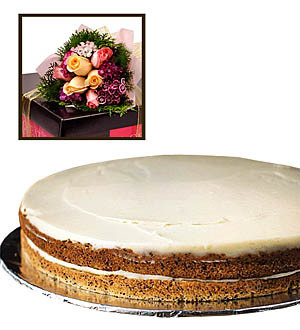 Cake featured available for delivery within Klang Valley and nearby vicinity. For other States, presentation of cake is subject to availability. Call 03-78830233 / 012-6915200 or email sales@gift-lab.com for more details.